We are a leading Manufacturer of aso test kit, crp test kit, rf latex slide test kit, rpr test kit and typhoid test kit from Bengaluru, India. 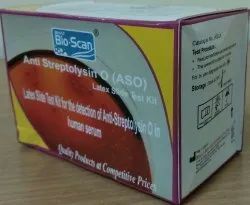 BHAT Bio-Scan® ASO latex slide Test is a latex agglutination Test for qualitative and semi quantitative in vitro determination of Anti- Streptolysin O in human serum. 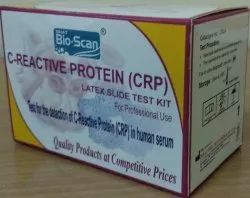 BHAT Bio-Scan® CRP latex slide Test is a latex agglutination Test for qualitative and semi quantitative in vitro determination of C-Reactive Protein (CRP) in human serum. Test for the detection of C - Reactive Protein (CRP) in human serum. 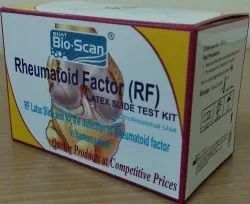 BHAT Bio-Scan® RF latex slide Test is a latex agglutination Test for qualitative and semi quantitative in vitro determination of Rheumatoid Factor in human serum. 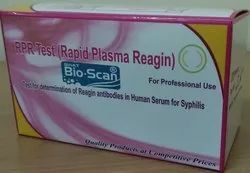 BHAT Bio-Scan® RPR (Rapid Plasma Reagin) Test is a Rapid Non Treponemal Test for qualitative and semi quantitative in vitro determination of regain antibodies in serum or plasma for syphilis using modified cardiolipin antigen. Rapid non treponemal tests for the detection of regain antibodies in serum or plasma for syphilis. 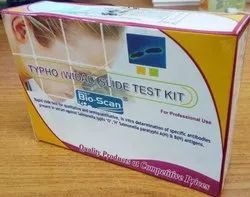 BHAT Bio-Scan® Typho WIDAL TEST is a rapid slide Test for qualitative & semi quantitative in vitro determination of specific antibodies present in serum against Salmonella typhi ‘O’ & ‘H’ antigen & Salmonella paratyphi A(H) & B(H) antigens. Looking for Serology Test Kits ?